UNITED NATIONS, October 27 -- For an Organization that preaches accountability, the UN system displays little of it. 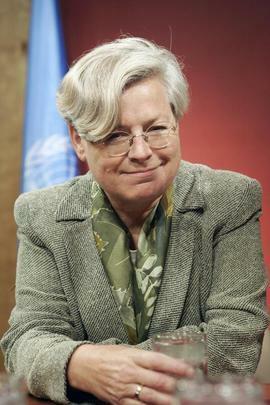 Three years after Eveline Herfkens of The Netherlands was exposed for violating UN system rules by accepting a substantial UN salary as well as $7,000 a month from her government -- allegedly as an entertainment budget -- and she was forced to step down, she had reappeared on the UN Advisory Group on social protection chaired by Michele Bachelet, convened by the International Labor Organization. At a UN press conference Thursday, Inner City Press asked if Ms. Herfkens' past had been ignored in giving her this new UN system post. Ms. Herfkens was in attendance, in the front row, but did not answer. The ILO's Juan Somavia said yes, there was a "controversy," but Herfkens' "experience" was deemed to trump it. This answer, and the question, were omitted from the UN's purported summary of the press conference, click here to view. So high officials in the UN can violate the rules but be quietly recycled back into UN system "advisory" jobs based on their experience. This is only one example. After the deadly bombing of the UN compound in the Canal Hotel in Baghdad in 2003, then Secretary General Kofi Annan's spokesman said that Ramiro Lopes da Silva would be required to resign but could "return to his 'D-2' (Director) post in World Food Programme," emphasizing that "his future assignments will not include any responsibilities for security matters." This did not in anyway respond to Ramiro Lopes da Silva's role in Iraq in connection with the Canal Hotel bombing, much less Kofi Annan's spokesman Fred Eckhard's statement that Ramiro Lopes da Silva's "future assignments will not include any responsibilities for security matters." Ramiro Lopes da Silva not having responded, Inner City Press asked the spokesman of Ban Ki-moon, who has inissted that UN system staff security is important to him, whether he gave Ramiro Lopes da Silva a waiver from the action of Kofi Annan after the Canal Hotel bombing, or if there was simply no UN system follow through. Spokesman Martin Nesirky said on October 25 that he would answer. But two days later he has not. Watch this site. Footnote: Herfkens' fall was in early 2008, before the global financial blow out later that year. On Thursday Inner City Press asked Michelle Bachelet about the place of privatization and, in essence, Wall Street in social protection plans. She said that the Report is for "all countries," but did not squarely address the privatization question. To be continued.